Leading researchers from the Leicester-based De Montfort University in the UK, will be exhibiting their expertise and international reputation for quality, research and innovation to help older people in smart home environments with their project ACROSSING – Advanced TeChnologies and PlatfoRm fOr Smarter Assisted LivING. ACROSSING envisions an easy-to-use technology infrastructure for assisted living in smart homes through a network of 26 leading European research groups, industry partners and user organisations. 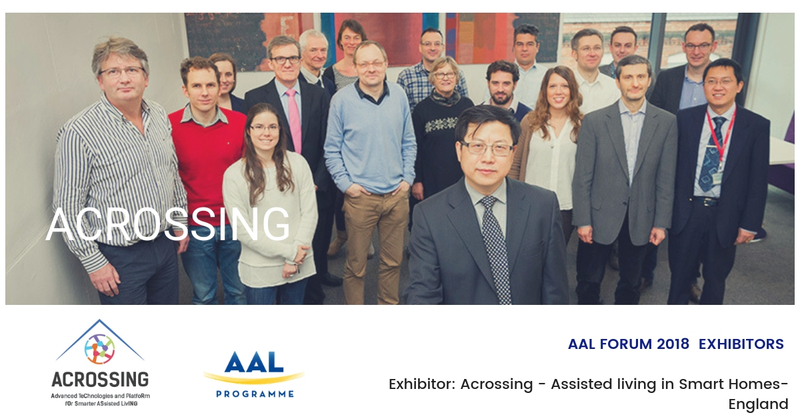 The project aims to develop smart home technologies, educate and train ESRs to become future research leaders in assisted living, and create an open smart home platform to increase competitiveness through best-practice. The ACROSSING network brings together all required knowledge, skills and stakeholders to offer a comprehensive training programme, whilst also focusing on four categories of smart home applications: Assisted living with cognitive impairments, Self-management of chronic diseases, Patient empowerment and citizen engagement and wellbeing, Early risk detection and prevention. Be sure to say hello to the passionate team from DMU at this year’s exhibition hall.